Free resource for you. 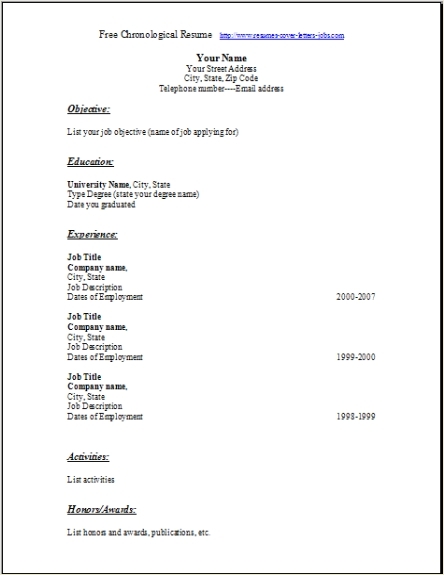 Three free blank resume templates. These templates are for you to use as a guide so you can compare what the three different formats will look like, when you fill in the information and create your resume. They are "free blank resume templates". They will show you where to place your information when you create your free resume. This website is here for you with the intent of providing you with all the options you need to create your resume for free. Whatever your choice in format, we are here to help. When you are finished with your resume, lets face it, three options are better than one. 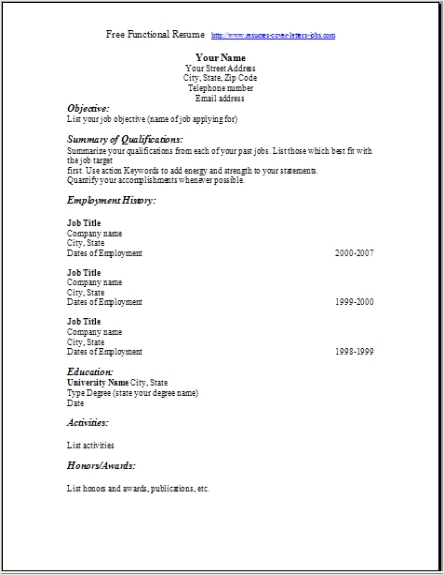 The free blank resume template examples that I have here can be downloaded and edited in word very easily. A complete way for you to come out of this website with all three formats. The template for the chronological format. The template for the functional format. The template for the combination format. Please add this site to your favorites for reference later. After you bookmark us, why not e-mail this page to all your friends so they can get their free resume. I always find everything quick when I need it on my desktop. These are the 3 favorite blank resume template formats used most when creating your resume. Nice and professional, but they don't over due in their design. All three of these templates make the information stand out, so the hiring manager doesn't have to spend extra time getting frustrated looking through your information. When you first glance at it, your skills and qualifications just seem to pop up. After all, that's what you will want your end result to be, once you edit all 3 of these resumes with your own information, you will be proud of the results. 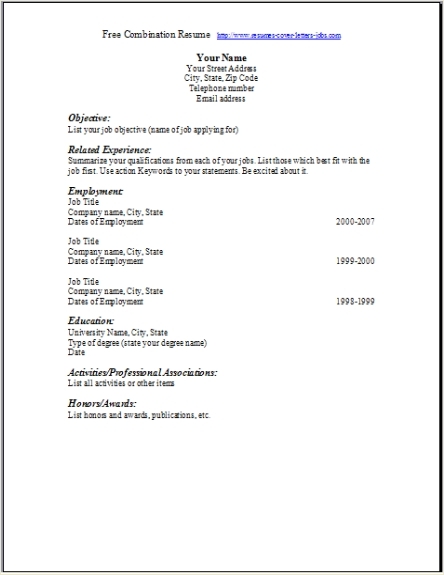 I hope you find these blank resume template useful enough to take the time to edit them in word to see the final results. The free blank resume template above was a new addition and I hope you like the choice of downloading 3 of the most useful blank resume formats. Use them as a guide only. Modify them to suit your own needs. Most people use Chronological. If you decide on downloading one of the free templates, then drop me a comment back on the contact us page. I would love to hear your comments on whether it helped you out.